Timing is everything . . .
How can we use the hidden patterns of the day to build the ideal schedule? Why do certain breaks dramatically improve student test results? When should you have your first coffee of the day? Why is singing in time with other people as good for us as exercise? And what is the ideal time to quit a job, switch careers or get married? 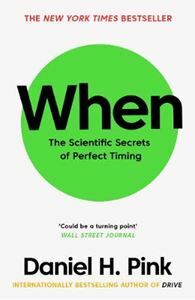 In When, Daniel H. Pink distills cutting edge research and data on timing and synthesises them into a fascinating, readable narrative. Packed with irresistible stories and practical takeaways, it provides compelling insights into how we can live richer, more engaged lives.